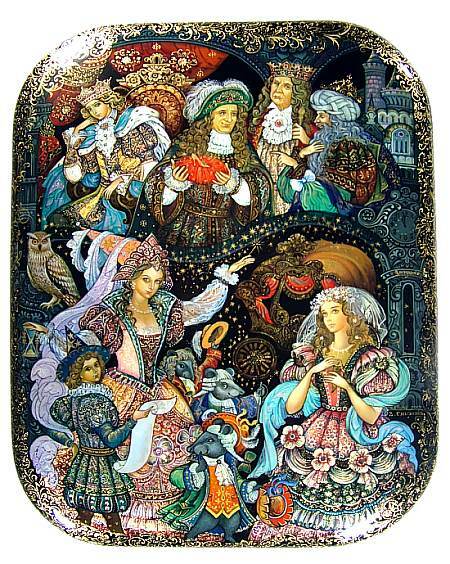 Cinderella and her Fairy Godmother are the center of attention in this lovely by Palekh artist Vera Smirnova. The clock is about to strike 12 and Cinderella is holding just one shoe now, the other lost in the rush to make it back before midnight. The Fairy Godmother is surrounded by her helpers, like the handsome mice, who will be soon be turned into horses to take the carriage back from the ball. Above them, the other shoe has been found, and the King and his subjects will embark on trying to find the real owner and future princess. 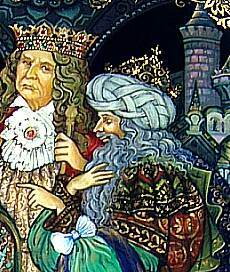 The prince rests his head and wonders who this girl could be. Vera Smirnova is known for her perfection in drawing faces, and she paints Cinderella and the Fairy Godmother with great style and beauty. Their clothing, too, captures one's attention and makes for a beautiful effect. 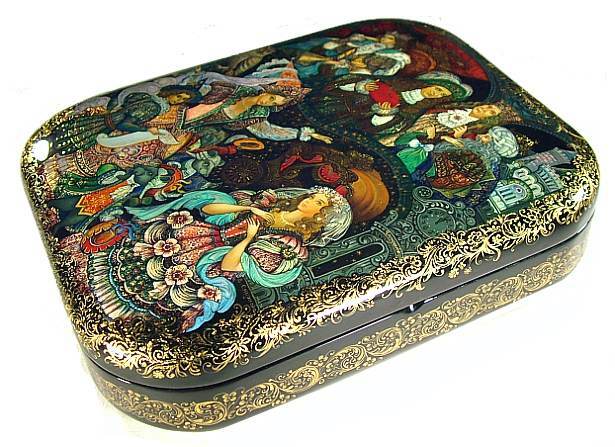 There are many other details on the box, as well, many using the radiant gold leaf. There is an elaborate gold ornament which adorns the sides of the box. The base color on the outside is black, the interior is traditional red. The box is made out of high quality papier mache and has a hinge at the top. It stands on four small carved legs. Signed at the bottom with the name of the box, village, year and title. Wonderful work.